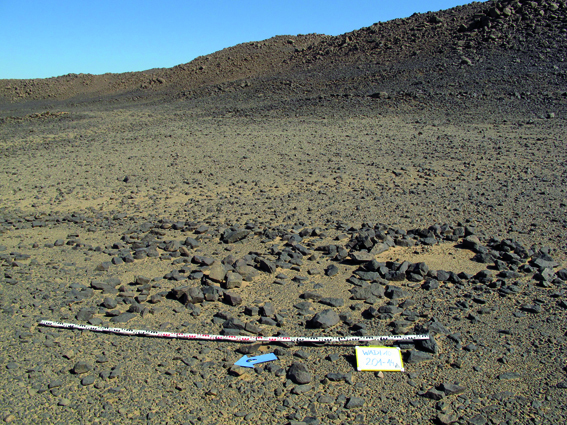 In 2015 and 2016, several small-scale archaeological sites were exemplarily excavated in order to clarify the date and function of several enigmatic archaeological structures. Different platform-like structures (so called “gravel beds” as well as “paved platforms”) showed no traces of burials and therefore cannot be interpreted as graves. The gravel beds seem to be camp and habitation installations and date to the Post-Meroitic and/or Medieval period. Paved platforms seem to have different functions, since they show heterogeneous find assemblages with different ceramics and ash concentrations. Several round-hut settlement structures were excavated, ranging from the late Palaeolithic to the Medieval period. Additionally to the date of the structures, the excavations showed indications of small-scale lightweight architectural components, but not massive enough to leave post-holes. Especially medieval round-hut settlements of the upper Wadi Abu Dom showed some interesting features which indicated a long-term use: The huts showed a comparably elaborated design, and pits with kitchen debris were found. Camp sites were also excavated. They did not show any traces of post-holes. Interestingly, no camp sites were dated earlier than the medieval period.